As the summer progresses and seasonal native plants begin their cycle of growth, attraction, and fruit bearing, I like to plod through my patch of the city to familiar spots where I find berries, leaves and flowers. This neighbourhood is a very built up residential area in midtown Toronto in close proximity to colleges and tourist attractions, and in spite of that there are still a few little oases of wild that exist mostly through abandonment and neglect. Don’t trespass, unless of course it is on a vacant lot that is accessible. Always leave lots of fruit and flowers for the birds and the pollinators. Go quietly about your foraging. Be discreet as to those with whom you share foraging locations – not everyone is respectful of the need to harvest in moderation. My kit includes scissors, a 3 quart fruit basket with handle, 1 pint and ½ pint berry boxes. I loop a stretch elastic to hold the basket around my waist for hands-free picking. 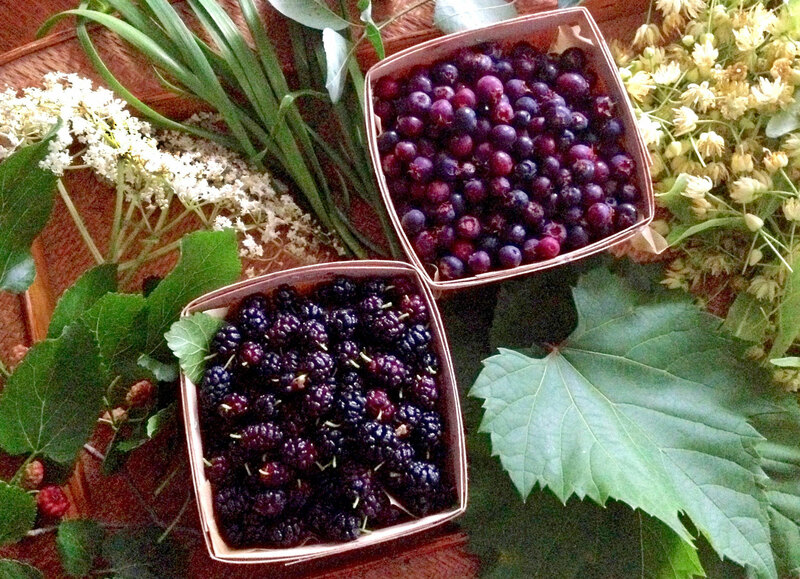 Black Mulberries are in abundance throughout July in this part of the world and while their sweet juice-filled berries are a fleeting pleasure, the leaves can be harvested throughout the growing season. Because the trees are found in so many parts of the world, I’m going to focus on the leaves of this one plant and demonstrate how to make a sweet tisane that will be refreshing hot or cold. 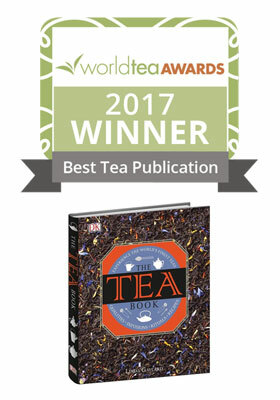 You’ll be happy you’ve put it by to enjoy throughout the year. 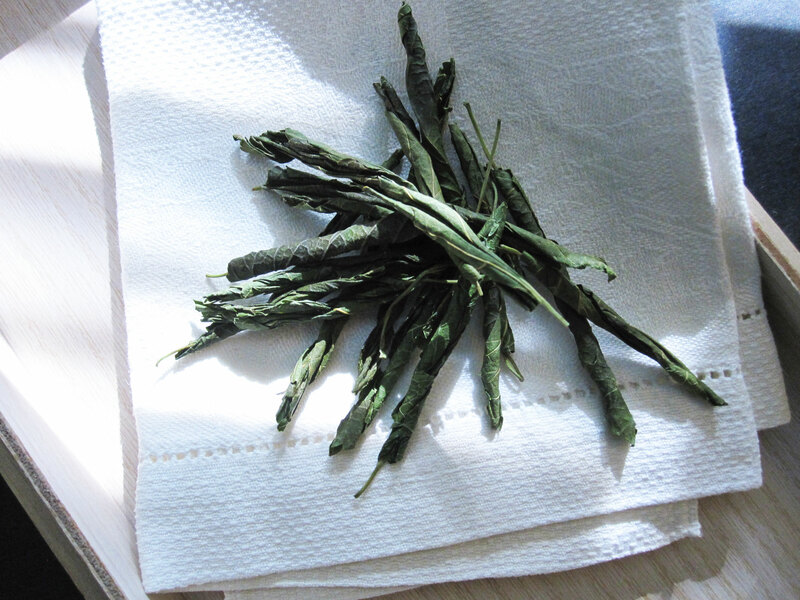 The leaves of the Black Mulberry can be wilted, rolled and air dried to create a pleasant, mildly sweet tisane. 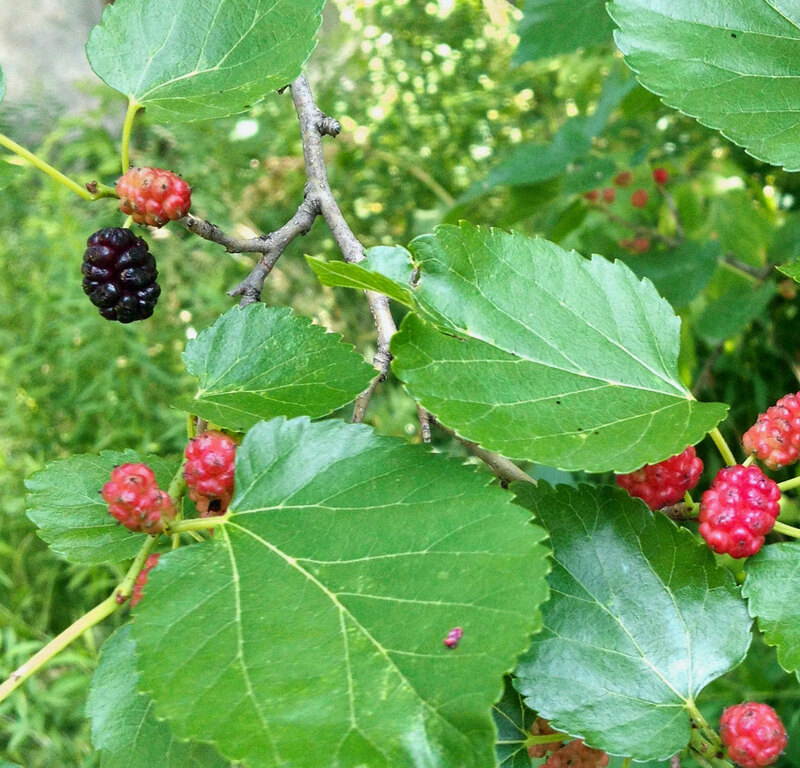 The Black Mulberry (Morus Nigra) found throughout Europe and North America is of the same genus, but a different species of Mulberry than that found in Asia – the kind silk worms love – but similar enough and safe to consume. 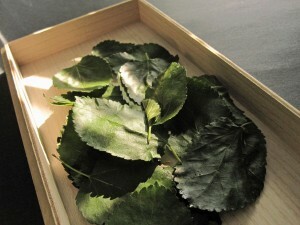 Pick the smallest leaves, about 1 ½ to 2 inches in diameter. Rinse them in cold water and pat dry. 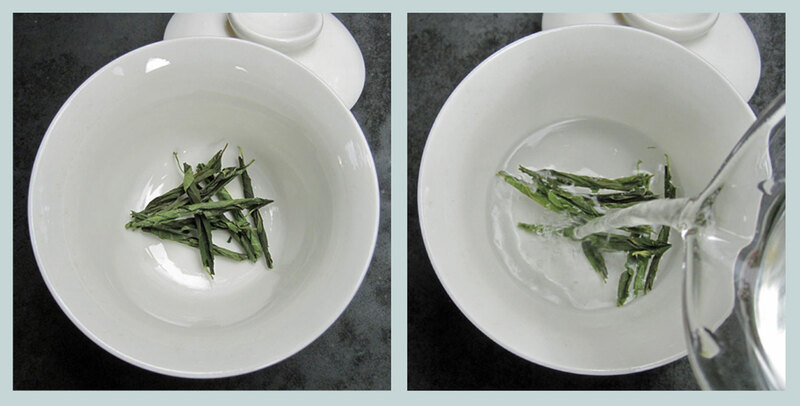 Put 10 – 15 leaves into a small vessel (I like to use a gaiwan) and pour over with boiling water. 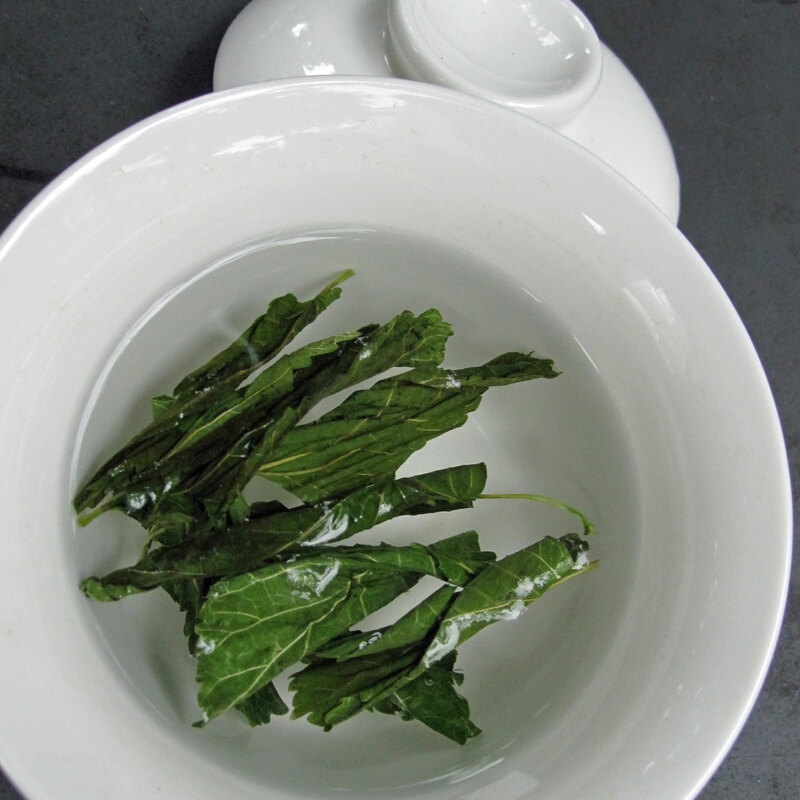 Infuse for 5 minutes. While researching the Mulberry leaf for The Tea Book (page 140), I discovered that the leaf has traditionally been used to treat symptoms of coughs, cold, flu and fever, sore throat and headache. I’ve enjoyed this tisane with no problems, but as with any herb, don’t overdo it. If you have doubts, ask your health practitioner if they think it is safe for you. 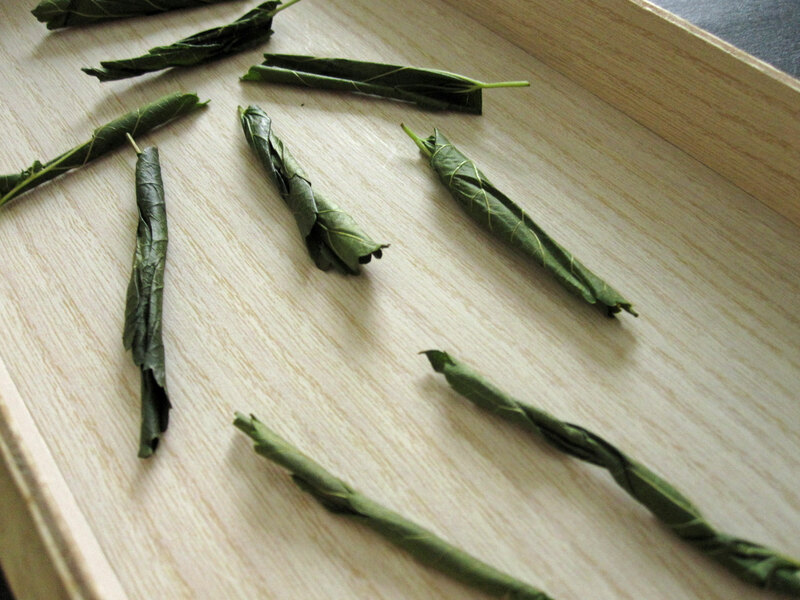 Apart from its pleasant sweetness, the most enjoyable part of this exercise is harvesting the leaf, especially when the berries are in season. One for the basket, one for me! The leaves can be harvested for several more months, so happy foraging!